I am looking at the manual for how to dump the tanks. The valves in the manual don't coincide with what is actually on the 5th wheel. 2012 Voltage. Any help would be greatly appreciated. Model of Voltage? How many grey/black tanks do you have? Looks like you have 2 grey tanks, bathroom and kitchen; and two black tanks, front toilet & rear toilet. On my 3105 ( 2 grey, 1 black), the main bathroom black dump valve pull handle is behind the left side cargo bay door, with the water & cable hookups. The front bathroom grey tank dump valve is Also there. 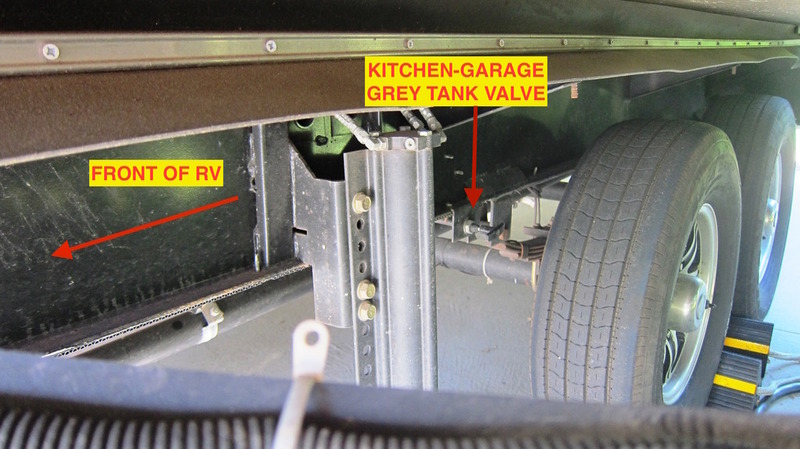 My kitchen grey tank dump valve is mounted on the frame, again on the left side, just before the rear wheels. It's under the living room slide, which makes accessing it a PITA. I don't have a rear bathroom, so not sure where they put that dump valve. Someone with a model with a rear toilet should be able to help. Be sure to dump the black tanks first, then the grey tanks to flush the lines. Never leave the black tanks open. Suspect you already know that. That's exactly the set up I have except I have a rear toilet, it has a valve on the frame same as the kitchen grey water. That could be the black water dump for it and am assuming I don't have a separate grey water tank for the rear bathroom. 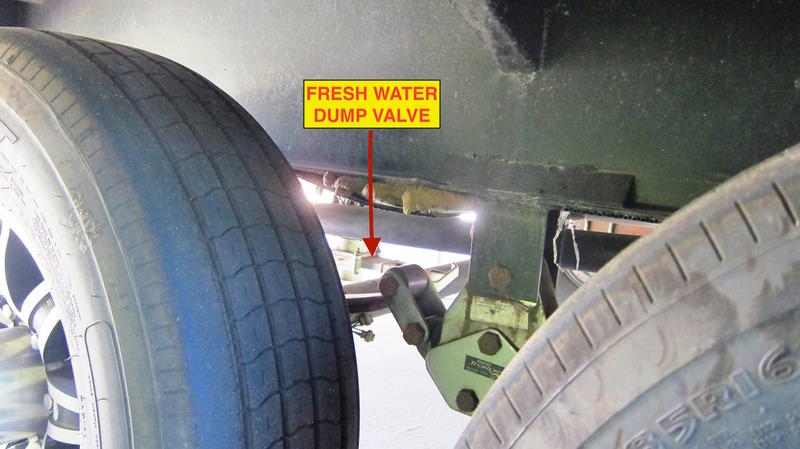 Do you use the san-flush when dumping the tanks? I have one under the cargo door and one on the other side of the RV. I understand they sometimes plumb the rear bathroom sink, and possibly the washer drain into one tank. Sounds like that's what you have. My routine is to drain the black tank, then use the San-e-Flush to rinse. I have a clear plastic elbow on my dump fitting so I can see when things run clean. After rinsing the black for awhile, I close the black handle with the San-e-Flush running for about 2 minutes, then I open the black valve and let it run until it looks clear, stop the San-e-Flush, and when flow stops, close the valve. I assume you could then do the rear black tank. Finish by emptying the grey tanks to flush the drain hose. Even after all that, the sensors still often read full. When setup for extended periods, we alternate leaving either the kitchen or bathroom grey tank open. Minimizes times I have to dump, and typically leaves one grey tank with water to flush the black tank lines. With just the two of us, I find we can safely go 4 or 5 days on black tank before having to dump. Probably somewhere under the rig, near your rear tires. I don't have a rear black tank, but here is where my rear grey tank dump handle is located... and while I'm at it, your fresh water tank dump valve is shown too. On my 3950 the rear bathroom only has one drain valve for both the toilet and the hand sink. it's located just in front of the drain pipe connection. My drain routine is drain both black tanks first (I have a tee design in my stinky slinkys) Close the small bathroom drain and use the san-e-flush. while that filling with water I drain the kitchen and the front bathroom grey. When they are drained I close the valves, move the san-e-flush to the front black tank and open the rear bathroom drain. Then open the front black drain and let the water run a little even after the tank is drained. This method makes rinsing the slinky's out super easy and never stinky. On my 3990, which has the rear bath also, I have two greys and two blacks. The front black in grey which is for the main bath and washer, is in the wet cabinet, along with the black for the main bath, as well as the sani-flush for main bath. 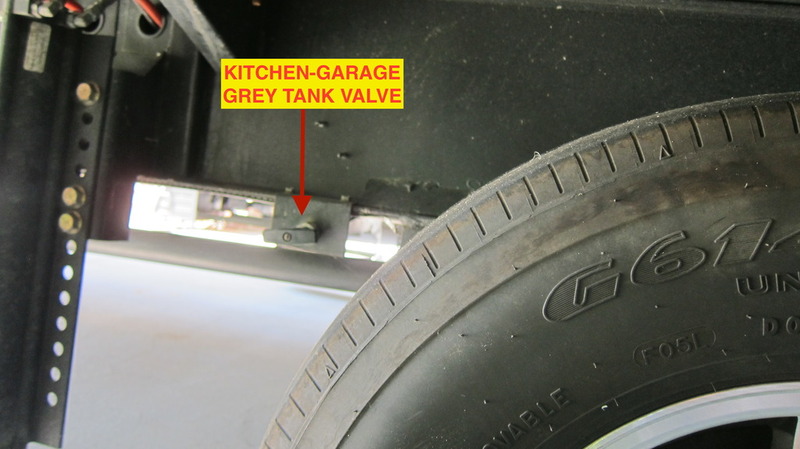 The rear bath black handle is right near the dump valve, while the grey tank valve for the rear bath and kitchen, is located above the middle tire under the slide (again a PITA). I also use a T valve with a small clear 6" section so I can see when I am completely "clean". 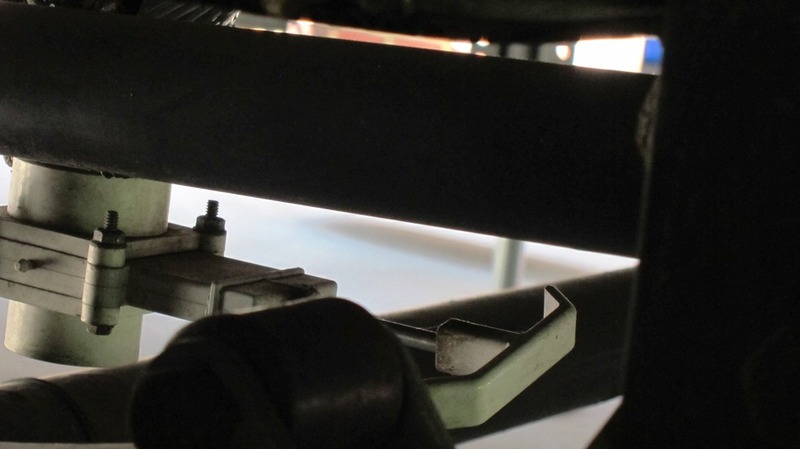 Sani-flush for rear black tank is located on the passenger side. While not recommended by manual, after I dump, I close the valve and then partially fill via sani-flush. DO NOT get distracted or overfill, as you will have quite a mess. Then after dumping again, I will run the sani-flush with the drain open for a few. May not be the best, but works for me. FYI, look up electric valves on this site. A lot of people have put them in. Problems solved!